Patek Philippe put their watchmaking prowess on full display with the Grand Complications collection. This series contains the world's most intricate and exclusive wristwatches, which are both status symbols and good investments. Patek Philippe is world renowned for their complicated pocket watches and wristwatches. Acoustic complications such as minute repeaters or chimes—grande and petite sonnerie—are this Genevan manufacturer's specialty. Patek Philippe is also well known for their use of perpetual calendars and split-seconds (double) chronographs. All of these complications appear in the Grand Complications collection. In fact, most of the watches in this series feature several of these functions. Patek Philippe equipped the Sky Moon Tourbillon with 12 complications and the Grandmaster Chime with 20. They are among the most complicated wristwatches ever made. However, this Genevan luxury watch manufacturer's expert craftsmanship stretches far beyond impressive technology. Their materials and finishes are also unrivaled. The impeccable platinum or white, yellow, or rose gold cases are often guillochéed by hand, intricately engraved, or adorned with flawless diamonds. The designs are timelessly elegant, making these watches both status symbols and worthy investments. How much does a Grand Complications cost? Are you looking for an intricate wristwatch with lots of functions? Then a luxury watch from the Grand Complications collection is perfect for you. With a Patek Philippe on your wrist, it's clear: You've made it. However, buying a Patek Philippe Grand Complications doesn't necessarily have to cost a fortune. Older models, such as the Perpetual Calendar ref. 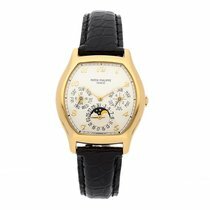 3940 with a perpetual calendar and moon phase display, can cost as little as 40,600 USD in mint condition. You can even shave a few thousand dollars off that price by purchasing a pre-owned timepiece. For a similar watch from the current collection (e.g., ref. 5327), expect prices between 63,800 and 69,600 USD. Prices quickly rise even further once you pair a perpetual calendar with a minute repeater. For example, the ref. 5304R has a skeletonized dial, which provides a view of the ornate automatic caliber R 27 PS QR LU, and costs about 290,000 USD pre-owned. If you'd prefer a mint-condition timepiece, be prepared to invest around 556,000 USD. You'll have to dig a bit deeper into your pockets for the ref. 5207. This watch includes a tourbillon and costs between 626,000 and 657,000 USD, depending on its condition. Those in the market for a perpetual calendar and a chronograph function should take a look at the ref. 5270. These timepieces have been part of the Patek catalog since 2018 and are available in rose gold or platinum. The manual caliber CH 29-535 PS Q provides the watch with a moon phase display, leap year display, and day/night indicator. Prices for these watches begin around 131,000 USD new and 124,000 USD pre-owned. The price climbs to 219,000 USD for a mint-condition ref. 5271P with 80 diamonds. Pre-owned pieces change hands for about 201,000 USD. Watches that combine a perpetual calendar and stopwatch function with a minute repeater, as seen in the ref. 5208R, cost between 893,000 and 1.12 million USD. Patek Philippe also couples perpetual calendars with split-seconds chronographs. The ref. 5204 sells for about 232,000 USD pre-owned. Prices for never-worn timepieces begin around 255,000 USD. If a minute repeater is non-negotiable, the Grand Complications collection has a number of watches to choose from. At 376,000 USD, the ref. 5078G is the most affordable. Its classic cream-colored enamel dial, small seconds at 6 o'clock, and Bregeut numerals and hands give this watch the feel of a pocket watch from a bygone era. The ref. 5539G features a tourbillon in addition to a minute repeater. Its sapphire glass case back provides a great view of this intricate complication at work. Plan to spend around 994,000 USD on this timepiece. 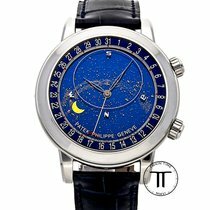 The Celestial models and their astronomical displays are a highlight within the Patek Philippe Grand Complications collection. The front of these timepieces features a star chart with the Milky Way. This is joined by displays for the mean solar time, date, and moon phase. A rose gold Celestial ref. 6102R demands about 232,000 USD in mint condition, while prices for a pre-owned example start around 204,000 USD. Prices for the platinum edition sit between 232,000 and 261,000 USD. You'll need an additional 35,000 USD if you prefer the model with a diamond-studded bezel. 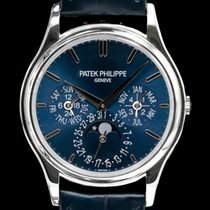 Patek Philippe caused a stir with their Sky Moon Tourbillon—reference number 5002—in 2001. At the time, the watch was the most complicated wristwatch Patek Philippe had ever developed. The Sky Moon Tourbillon features 12 complications and was also the first double-faced Patek Philippe watch. The front displays the time, day, date, month, age of the moon, and leap year cycle. Flip it over and you will find many different astronomical complications such as a depiction of the night sky, the phases of the moon, and sidereal time. A sidereal day is the amount of time it takes for the Earth to make one rotation relative to the vernal equinox and, on average, is about four minutes shorter than the typical 24-hour day. Of course, all those complications come at a price. A never-worn Sky Moon Tourbillon 5002P typically sells for around 1.28 million USD. With any luck, you may find a well-maintained example for as little as 898,000 USD. The new version of the Sky Moon Tourbillon was released in 2013. It bears the reference number 6002 and is almost identical to the previous version in terms of functionality. However, the 6002 has an enamel dial and an intricately engraved white gold case. These masterpieces also cost a pretty penny. Expect to pay about 2 million USD for a new ref. 6002G. Pre-owned timepieces in very good condition change hands for around 1.16 million USD. Patek Philippe's Grandmaster Chime is one of the world's most complicated wristwatches. The family-run manufacturer presented the watch with reference number 5175 in 2014, in celebration the company's 175th anniversary. This model has two dials and a total of 20 complications. The "chime" in its name refers to the watch's acoustic complications, amongst them a grand and petite sonnerie, minute repeater, alarm function, and date repeater. The alarm and date repeater were new, revolutionary complications. Thanks to its perpetual calendar, the watch always knows which date to chime. The alarm function is another special complication. Similar to a minute repeater, the alarm chimes first the hour, then the quarter hour, and then the minutes. The mechanism begins two minutes before the set time so that you are able to hear the entire orchestra. With a case diameter of 47.4 mm and a thickness of 16.1 mm, the Grandmaster Chime is certainly still wearable. Inside its hand-engraved, rose gold case is the caliber 300 GS AL 36-750 QIS FUS IRM, which is comprised of 1,366 pieces. Aside from the acoustic complications, the movement has a power reserve for the going train and chime, a perpetual calendar, a moon phase display, and a day/night indicator. Patek Philippe only produced seven of these watches, one of which resides in the Patek Philippe Museum in Geneva. Since then, Patek Philippe has added the reference number 6300G to their regular catalog. While it has all the same technology as the anniversary model, the series model lacks its fine engraving. What's more, the current edition has a white gold case. You can all this technological masterpiece your own for about 3.48 million USD. With 24 complications, the Graves Supercomplication has long been considered one of the most intricate pocket watches in existence, and, until 1989, it held the record. It features a double chronograph, perpetual calendar, sidereal time display, and displays the sunrise and sunset time, as well as the night sky over New York City. Patek Philippe made the watch with reference number 198385 for the American banker Henry Graves, Jr., who lived in New York. Graves was a passionate watch collector who loved Patek Philippe watches. He was embroiled in a competition with the automobile manufacturer James Ward Packard. Both men commissioned multiple watches from Patek Philippe in hopes of having a watch with more complications than their rival's. In the end, Graves won with the Graves Supercomplication, which he ordered in 1925. Producing the pocket watch took seven years. Whether or not Patek Philippe could have built an even more complicated watch at the beginning of the 1930s is unclear. Packard died in 1928 and was unable to commission any more watches. It took Patek Philippe until 1989 to create a watch more complicated than the Graves Supercomplication. That year, they released the Calibre 89, a pocket watch with 33 complications. The Calibre 89 had a perpetual calendar, a moon phase and moon age display, a double chronograph, and a second time zone display all on the dial side. The back side had different astronomical complications. The Calibre 89 also has acoustic complications such as a minute repeater, a grande and petite sonnerie, and an alarm. The development and production of this watchmaking masterpiece took nine years. The Calibre 89 remains one of the most complicated pocket watches in the world today. In 2015, the Swiss luxury watch manufacturer Vacheron Constantin presented a pocket watch with a total of 57 complications. The pocket watch, reference number 57260, was made especially for a wealthy customer who wished to remain anonymous. One highlight of this pocket watch is its different calendars. Aside from the traditional Gregorian perpetual calendar, it also has a Hebrew perpetual calendar, a professional business calendar according to the ISO 8601 standard, and an astronomical calendar.